At 28th-31st of October 2012 in Taipei (Taiwan) 23rd International Conference of Committee on Data for Science and Technology (CODATA) - “Open Data and Information for Changing Planet” took place. Event was held on a territory of National Academy of Sciences of Taiwan. Apart from opening ceremony and plenary sessions, conference program contained 36 parallel sessions connected with questions of administration and exchange of scientific and technical data and their usage. Among highly ranked spokesperson was president of International Council for Science (ICSU) laureate of Nobel Prize in chemistry Yuan Tseh Lee. Traditional CODATA award for achievements in sphere of data sciences, 2012, was received by specialist in sphere of geoinformatic sciences, professor Michael F. Goodchild. Head of laboratory on geoinformatics and geomagnetic researches GC RAS candidate of sciences - A. 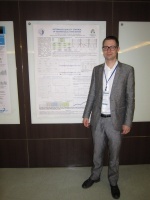 A. Soloviov made his report on “Russian-Ukrainian Center of Geomagnetic Data” during the session “Earth and Environment” and poster report on “Automatized control of quality of geophysical modern rows”. During the closing ceremony he received an award on the best poster from CODATA president Huadong Guo. As a secretary of research CODATA group - “Interoperability of Scientific Data on Earth and Space”. A. A. Soloviov made a report on the latest achievements of the group. They were demonstrating electronic edition of Atlas of magnetic field of Earth for 1500-2010, issued at 2012. After CODATA conference two-days 28th General Assembly of CODATA took place, where A. A. Soloviov participated as delegate of The International Union of Geodesy and Geophysics (IUGG). He also received a right to speak for Ukraine as a national member of CODATA.